Honor the Great Houses of Westeros! 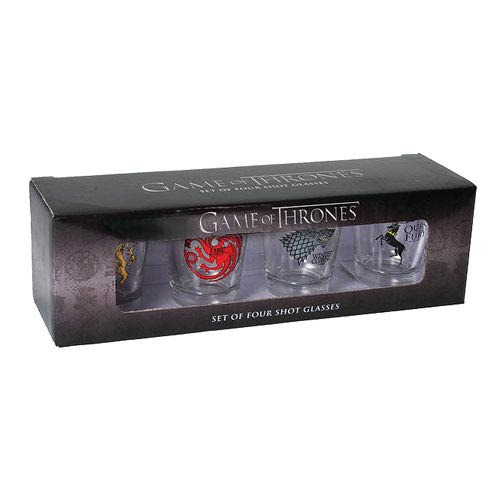 Four shot glasses feature the sigils of Lannister, Targaryen, Stark, and Baratheon. Based on HBO's Game of Thrones TV series. Drink to all four houses! Houses Lannister, Baratheon, Stark, and Targaryen - unite! But only for the nonce, whilst there's drink to be had. Getting those 4 Great Houses of Westeros to get along could only be accomplished with an abundance of booze, which is why the sigils and words of each house are not inscribed on a 4-pack of swords, but rather on a 4-pack of 1-ounce shot glasses. Order the Game of Thrones House Sigils Shot Glass 4-Pack based on HBO's Game of Thrones TV series and have yourself a merry old time as you watch the show or read the books! Ages 14 and up.